BAM International bv is a worldwide operating company of Royal BAM Group. Founded in the Netherlands in 1869, Royal BAM Group is one of the largest European construction firms. The Group comprises various operating companies, each with its own subsidiaries and specialisations, and thus provides a complete range of activities to enable the undertaking of large-scale projects independently or in joint ventures. Our mission is to deploy the contracting activities of Royal BAM Group and its subsidiaries outside Europe: Australia, Asia Pacific, Middle East and Gulf States, the Americas and Africa, where due to the size of the continent our operations are now divided into two separate organisational units. 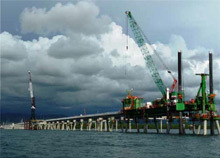 Established in 1958, BAM International has gained broad international experience and know-how in the fields of marine work, general building, infrastructure and industrial projects. Local presence in East and Southern Africa enables us to be part of the region’s economic success. Since 2004, BAM International has had a continuous presence in East Africa. Airport projects in Dar es Salaam and a series of road projects have resulted in continuity on the ground and a strong name in the market. The establishment of a regional office in Dar es Salaam confirms our commitment to the region. BAM International’s Area East Africa encompasses the East and South African region focusing on Kenya, Tanzania and Mozambique. In addition, we keep an eye on opportunities in Rwanda, Uganda, South Africa, Zimbabwe and Namibia. Economic growth in the region is fueled to a large extent by a recent and continuing string of gas findings along the coast of Kenya, Tanzania and Mozambique. Our attention lies with private as well as public funded projects. In the private sector our focus is on port development related to the oil and gas sector and various mining initiatives. Public funded projects would involve container terminals, roads and projects in the water and sanitation sector. "We are convinced that we can play our part through projects that are beneficial to the region as well as profitable for BAM International."